procedures, osteotomies to reduce joint stresses, platelet-rich plasma (PRP) injection therapy, and other orthobiologic techniques. He treats ACL injuries, patellar dislocations, meniscal tears, multi-ligamentous knee injuries, and knee arthritis with minimally invasive and arthroscopic techniques. He is also extensively trained in arthroscopic management of shoulder problems, such as impingement, rotator cuff tears, and labral tears. 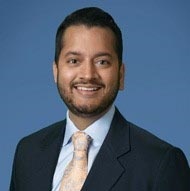 Dr. Patel trained at Northwestern University and completed his fellowship at the worldrenowned Cleveland Clinic, building his expertise in the most innovative orthopaedic procedures. Dr. Patel practices evidence-based sports medicine and believes it is essential to know when ‘not to operate’.